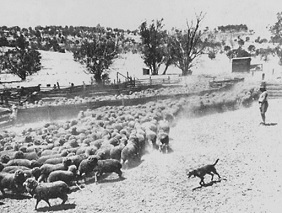 Do you have ancestors in South Australia who owned sheep? If so, make sure you search these brand directories! These are a unique, but incredibly useful source for family historians or anyone looking to build their family tree. Local historians will also find them a great resource, with the ability to easily reconstruct lists of stockowners in their region. What is a "Sheep Brand?" Owners branded their stock with a unique symbol or combination of symbols and/or letters. This identified who the animal/s belonged to. This volume contains tens of thousands of such brands for those in South Australia, from two directories: 1936 & 1938.